Binary systems made up of two massive objects orbiting each other are an important source for gravitational-wave astronomy. The system emits gravitational radiation as it orbits, these carry away energy and momentum, causing the orbit to shrink. Shown here is a binary white dwarf system, an important source for space-borne detectors like eLISA. The eventual merger of the white dwarfs may result in a supernova, represented by the explosion in the third panel. 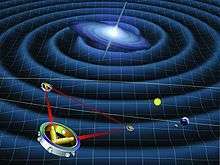 Gravitational waves have a solid theoretical basis, founded upon the theory of relativity. They were first predicted by Einstein in 1916; although a specific consequence of general relativity, they are a common feature of all theories of gravity that obey special relativity. Indirect observational evidence for their existence first came in 1974 from measurements of the Hulse–Taylor binary pulsar, whose orbit evolves exactly as would be expected for gravitational wave emission. Richard Hulse and Joseph Taylor were awarded the 1993 Nobel Prize in Physics for this discovery. Subsequently, many other binary pulsars (including one double pulsar system) have been observed, all fitting gravitational-wave predictions. On 11 February 2016 it was announced that LIGO had directly observed the first gravitational waves in September 2015. The second observation of gravitational waves was made on 26 December 2015 and announced on 15 June 2016. In 2015, the LIGO project was the first to directly observe gravitational waves using laser interferometers. The LIGO detectors observed gravitational waves from the merger of two stellar-mass black holes, matching predictions of general relativity. These observations demonstrated the existence of binary stellar-mass black hole systems, and were the first direct detection of gravitational waves and the first observation of a binary black hole merger. This finding has been characterized as revolutionary to science, because the verification of our ability to use gravitational-wave astronomy to progress in our search and exploration of dark matter and the big bang. There are several current scientific collaborations for observing gravitational waves. There is a world-wide network of ground-based detectors, these are kilometre-scale laser interferometers including: the Laser Interferometer Gravitational-Wave Observatory (LIGO), a joint project between MIT, Caltech and the scientists of the LIGO Scientific Collaboration with detectors in Livingston, Louisiana and Hanford, Washington; Virgo, at the European Gravitational Observatory, Cascina, Italy; GEO600 in Sarstedt, Germany, and the Kamioka Gravitational Wave Detector (KAGRA), operated by the University of Tokyo in the Kamioka Observatory, Japan. LIGO and Virgo are currently being upgraded to their advanced configurations. Advanced LIGO began observations in 2015, detecting gravitational waves even though not having reached its design sensitivity yet; Advanced Virgo is expected to start observing in 2016. The more advanced KAGRA is scheduled for 2018. GEO600 is currently operational, but its sensitivity makes it unlikely to make an observation; its primary purpose is to trial technology. Astronomy has traditionally relied on electromagnetic radiation. Astronomy originated with visible-light astronomy and what could be seen with the naked eye. As technology advanced, it became possible to observe other parts of the electromagnetic spectrum, from radio to gamma rays. Each new frequency band gave a new perspective on the Universe and heralded new discoveries. Late in the 20th century, the detection of solar neutrinos founded the field of neutrino astronomy, giving an insight into previously invisible phenomena, such as the inner workings of the Sun. The observation of gravitational waves provides a further means of making astrophysical observations. Gravitational waves provide complementary information to that provided by other means. By combining observations of a single event made using different means, it is possible to gain a more complete understanding of the source's properties. This is known as multi-messenger astronomy. Gravitational waves can also be used to observe systems that are invisible (or almost impossible to detect) to measure by any other means, for example, they provide a unique method of measuring the properties of black holes. 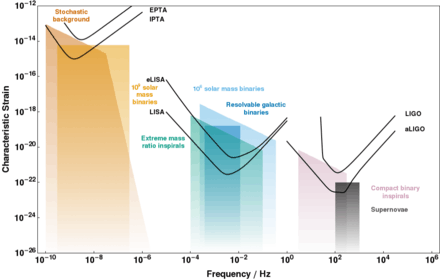 Cosmic inflation, a hypothesized period when the universe rapidly expanded 10−36 s after the Big Bang, would have given rise to gravitational waves; they would have left a characteristic imprint in the polarization of the CMB radiation. It is possible to calculate the properties of the primordial gravitational waves from measurements of the patterns in the microwave radiation, and use this to learn about the early universe. Again, the gravitational waves are not directly detected, but their presence must be inferred from other astronomical techniques. Ground-based detectors yield new information about the inspiral phase and mergers of binary stellar mass black holes, and binaries consisting of one such black hole and a neutron star (a candidate mechanism for some gamma ray bursts). 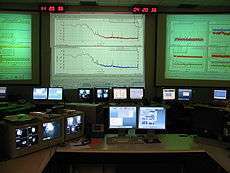 They could also detect signals from core-collapse supernovae, and from periodic sources such as pulsars with small deformations. If there is truth to speculation about certain kinds of phase transitions or kink bursts from long cosmic strings in the very early universe (at cosmic times around 10−25 seconds), these could also be detectable. Space-based detectors like LISA should detect objects such as binaries consisting of two white dwarfs, and AM CVn stars (a white dwarf accreting matter from its binary partner, a low-mass helium star), and also observe the mergers of supermassive black holes and the inspiral of smaller objects (between one and a thousand solar masses) into such black holes. LISA should also be able to listen to the same kind of sources from the early universe as ground-based detectors, but at even lower frequencies and with greatly increased sensitivity. ↑ Stairs, Ingrid H. (2003). "Testing General Relativity with Pulsar Timing". Living Reviews in Relativity. 6: 5. arXiv:astro-ph/0307536 . Bibcode:2003LRR.....6....5S. doi:10.12942/lrr-2003-5. ↑ LIGO Scientific Collaboration and Virgo Collaboration; Abbott, B. P.; Abbott, R.; Abbott, T. D.; Abernathy, M. R.; Acernese, F.; Ackley, K.; Adams, C.; Adams, T. (2016-06-15). "GW151226: Observation of Gravitational Waves from a 22-Solar-Mass Binary Black Hole Coalescence". Physical Review Letters. 116 (24): 241103. doi:10.1103/PhysRevLett.116.241103. ↑ Pretorius, Frans (2005). "Evolution of Binary Black-Hole Spacetimes". Physical Review Letters. 95 (12): 121101. arXiv:gr-qc/0507014 . Bibcode:2005PhRvL..95l1101P. doi:10.1103/PhysRevLett.95.121101. ISSN 0031-9007. PMID 16197061. ↑ Campanelli, M.; Lousto, C. O.; Marronetti, P.; Zlochower, Y. (2006). "Accurate Evolutions of Orbiting Black-Hole Binaries without Excision". Physical Review Letters. 96 (11): 111101. arXiv:gr-qc/0511048 . Bibcode:2006PhRvL..96k1101C. doi:10.1103/PhysRevLett.96.111101. ISSN 0031-9007. PMID 16605808. ↑ Baker, John G.; Centrella, Joan; Choi, Dae-Il; Koppitz, Michael; van Meter, James (2006). "Gravitational-Wave Extraction from an Inspiraling Configuration of Merging Black Holes". Physical Review Letters. 96 (11): 111102. arXiv:gr-qc/0511103 . Bibcode:2006PhRvL..96k1102B. doi:10.1103/PhysRevLett.96.111102. ISSN 0031-9007. PMID 16605809. ↑ Abbott, B. P.; Abbott, R.; Abbott, T. D.; Abernathy, M. R.; Acernese, F.; Ackley, K.; Adams, C.; Adams, T.; Addesso, P. (2016-02-11). "Observation of Gravitational Waves from a Binary Black Hole Merger". Physical Review Letters. 116 (6). arXiv:1602.03837 . Bibcode:2016PhRvL.116f1102A. doi:10.1103/PhysRevLett.116.061102. ISSN 0031-9007. ↑ Sesana, A. (22 May 2013). "Systematic investigation of the expected gravitational wave signal from supermassive black hole binaries in the pulsar timing band". Monthly Notices of the Royal Astronomical Society: Letters. 433 (1): L1–L5. arXiv:1211.5375 . Bibcode:2013MNRAS.433L...1S. doi:10.1093/mnrasl/slt034. ↑ Nelemans, Gijs (7 May 2009). "The Galactic gravitational wave foreground". Classical and Quantum Gravity. 26 (9): 094030. arXiv:0901.1778 . Bibcode:2009CQGra..26i4030N. doi:10.1088/0264-9381/26/9/094030. ↑ Stroeer, A; Vecchio, A (7 October 2006). "The LISA verification binaries". Classical and Quantum Gravity. 23 (19): S809–S817. arXiv:astro-ph/0605227 . Bibcode:2006CQGra..23S.809S. doi:10.1088/0264-9381/23/19/S19. ↑ Volonteri, Marta; Haardt, Francesco; Madau, Piero (10 January 2003). "The Assembly and Merging History of Supermassive Black Holes in Hierarchical Models of Galaxy Formation". The Astrophysical Journal. 582 (2): 559–573. arXiv:astro-ph/0207276 . Bibcode:2003ApJ...582..559V. doi:10.1086/344675. ↑ Sesana, A.; Vecchio, A.; Colacino, C. N. (11 October 2008). "The stochastic gravitational-wave background from massive black hole binary systems: implications for observations with Pulsar Timing Arrays". Monthly Notices of the Royal Astronomical Society. 390 (1): 192–209. arXiv:0804.4476 . Bibcode:2008MNRAS.390..192S. doi:10.1111/j.1365-2966.2008.13682.x. ↑ Amaro-Seoane, P. (May 2012). "Stellar dynamics and extreme-mass ratio inspirals". arXiv:1205.5240 . Bibcode:2012arXiv1205.5240A. ↑ Berry, C. P. L.; Gair, J. R. (12 December 2012). "Observing the Galaxy's massive black hole with gravitational wave bursts". Monthly Notices of the Royal Astronomical Society. 429 (1): 589–612. arXiv:1210.2778 . Bibcode:2013MNRAS.429..589B. doi:10.1093/mnras/sts360. ↑ Amaro-Seoane, Pau; Gair, Jonathan R; Freitag, Marc; Miller, M Coleman; Mandel, Ilya; Cutler, Curt J; Babak, Stanislav (7 September 2007). "Intermediate and extreme mass-ratio inspirals—astrophysics, science applications and detection using LISA". Classical and Quantum Gravity. 24 (17): R113–R169. arXiv:astro-ph/0703495 . Bibcode:2007CQGra..24R.113A. doi:10.1088/0264-9381/24/17/R01. ↑ Gair, Jonathan; Vallisneri, Michele; Larson, Shane L.; Baker, John G. (2013). "Testing General Relativity with Low-Frequency, Space-Based Gravitational-Wave Detectors". Living Reviews in Relativity. 16: 7. arXiv:1212.5575 . Bibcode:2013LRR....16....7G. doi:10.12942/lrr-2013-7. ↑ Kotake, Kei; Sato, Katsuhiko; Takahashi, Keitaro (1 April 2006). "Explosion mechanism, neutrino burst and gravitational wave in core-collapse supernovae". Reports on Progress in Physics. 69 (4): 971–1143. arXiv:astro-ph/0509456 . Bibcode:2006RPPh...69..971K. doi:10.1088/0034-4885/69/4/R03. ↑ Binétruy, Pierre; Bohé, Alejandro; Caprini, Chiara; Dufaux, Jean-François (13 June 2012). "Cosmological backgrounds of gravitational waves and eLISA/NGO: phase transitions, cosmic strings and other sources". Journal of Cosmology and Astroparticle Physics. 2012 (6): 027–027. arXiv:1201.0983 . Bibcode:2012JCAP...06..027B. doi:10.1088/1475-7516/2012/06/027. ↑ Damour, Thibault; Vilenkin, Alexander (2005). "Gravitational radiation from cosmic (super)strings: Bursts, stochastic background, and observational windows". Physical Review D. 71 (6): 063510. arXiv:hep-th/0410222 . Bibcode:2005PhRvD..71f3510D. doi:10.1103/PhysRevD.71.063510. ↑ Schutz, Bernard F (21 June 2011). "Networks of gravitational wave detectors and three figures of merit". Classical and Quantum Gravity. 28 (12): 125023. arXiv:1102.5421 . Bibcode:2011CQGra..28l5023S. doi:10.1088/0264-9381/28/12/125023. ↑ Hu, Wayne; White, Martin (1997). "A CMB polarization primer". New Astronomy. 2 (4): 323–344. arXiv:astro-ph/9706147 . Bibcode:1997NewA....2..323H. doi:10.1016/S1384-1076(97)00022-5. ↑ Kamionkowski, Marc; Stebbins, Albert; Stebbins, Albert (1997). "Statistics of cosmic microwave background polarization". Physical Review D. 55 (12): 7368–7388. arXiv:astro-ph/9611125 . Bibcode:1997PhRvD..55.7368K. doi:10.1103/PhysRevD.55.7368.